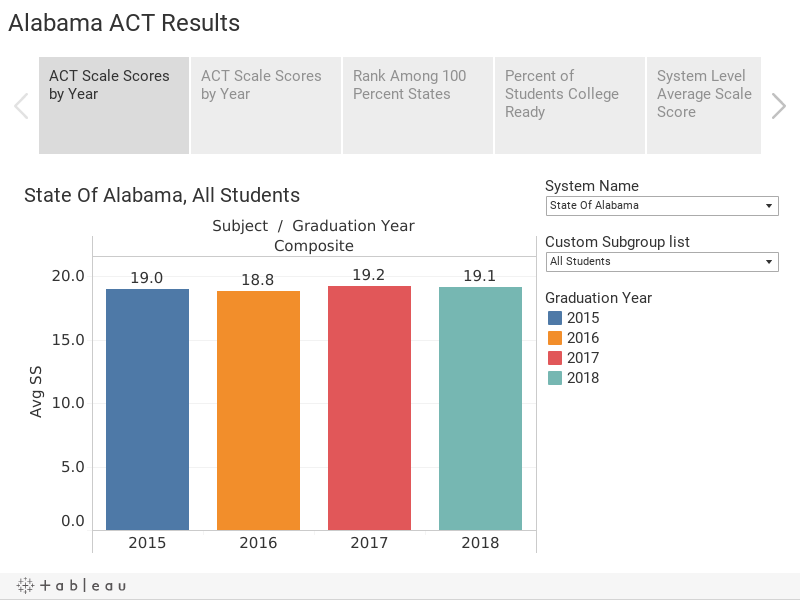 Alabama public high school students’ performance on the ACT was down slightly in 2018, after hitting a high point in 2017. Alabama students’ average score was 19.1 on a 36-point scale, compared to 19.2 in 2017. Over the past four years, Alabama scores have been stable, roughly paralleling the slight up and down of national scores. Interactive charts in this report allow you to explore the results by system, and school, by subject, and by year. The ACT is a test of college readiness and is used by colleges as a factor in the evaluation of applicants’ qualifications for admission. Alabama is one of 17 states that gives the ACT to all public high school students, whether they plan to apply for college or not. Among the states that give the test to all public high school students, Alabama ranks 13th, tied with North Carolina. The average scale score among the 100 percent states is 19.5. More Alabama students, a higher percentage of enrolled seniors, and more students of color took the ACT in 2018, according to data provided by ACT and the Alabama Department of Education. This was particularly notable among Hispanic students. Though small in total numbers compared to whites and blacks, the number of Hispanics taking the ACT increased from 1,867 in 2015 to 2,886 in 2018 (55% increase). Black students taking the ACT increased over this period from 16,602 to 16,968 (2% increase), and whites slightly decreased from 29,337 to 29,100 (less than 0% change). Alabama public schools give the ACT in the junior year of high school. The final reported results here are for the students who graduated in 2018. Those students would have taken the ACT in 2017 at their own high school. If a student took the test subsequent to the administration at their high school, the student’s highest scores in each subject would be counted. In 2018, 85 out of 137 school systems in Alabama posted higher average composite scores on the ACT than they did in 2015. The top 10 systems in terms of improvement on students’ average composite score between 2015 and 2018 are listed below.  A more complete listing can be found in the interactive charts. On average, students from economically disadvantaged families tend to score lower on standardized tests than students who are not at an economic disadvantage. Similarly, schools where a higher percentage of the student body is economically disadvantaged, the average test score tends to be lower. Comparing schools that have similar demographics is a fairer way to evaluate relative performance. Scatterplot charts, like the one featured below, present score data and student poverty levels at the same time. The vertical position of the school or system is determined by the average test score, while the horizontal location of the school or system is determined by the percentage of the student body directly eligible for a free lunch under the national free lunch program. Keep in mind that a composite score of 18 is considered a minimum threshold score for college admission at several state colleges. Others have lower thresholds, including open admissions. On the other end, a score of 25 or higher is expected at more competitive colleges, while 30 is the minimum threshold at some of the nationally elite schools such as Princeton. The table below lists the median entering ACT composite score students at Alabama colleges. Historically black colleges consider it part of their mission to admit students who may not have had the academic preparation to perform well on the ACT. The average ACT score for black students in Alabama is 16.5. With just a few hours remaining to file state and federal taxes, revisit our 2018 analysis of state and local taxes, originally published in December 2018. Annually, the U.S. Census Bureau surveys state and local governments across the country about their revenues and expenditures. This survey makes it possible to compare the finances of state and local government across the 50 states. 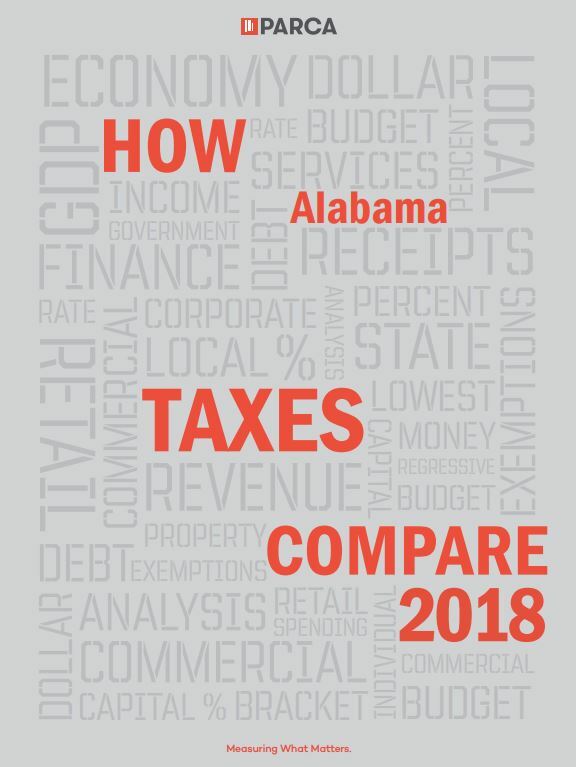 In PARCA’s analysis of the data, How Alabama Taxes Compare, state and local revenues are considered together because states vary greatly in how they divide up the responsibilities between state and local governments for financing the operation of services like schools, roads, courts, health care, and public safety. In the end, the combined revenue from state and local taxes is used to provide government services. The data for 2016 is the most recent year available. An interactive version of the data is also available through PARCA’s data dashboard. A slight majority of Alabamians oppose building new prisons, but an overwhelming majority support expanding rehabilitation and re-entry programs for people leaving prison, returning nonviolent offenders to the community, and spending more on education. 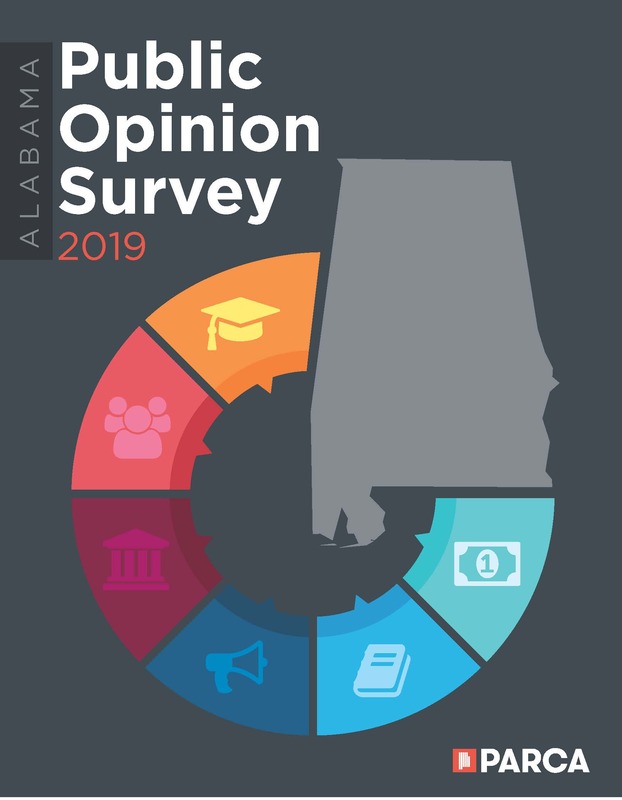 These are among the key findings of the Public Affairs Research Council of Alabama’s Public Opinion Survey: 2019 Edition, released today. The survey, conducted in partnership with Samford University and led by Dr. Randolph Horn, again found high levels of agreement on critical issues facing the state. Alabamians value education, rating it a top priority among major state services. State residents say education investment should be increased, as too little is now spent on education. While not agreeing on the source of revenue, a majority of residents are willing to pay more in taxes to increase funding for education. There is some evidence that the current tax system is seen as regressive: majorities of residents say low-income residents pay too much, and those with higher incomes pay too little. Consistently high percentages of Alabamians feel that they have no say in Montgomery or that state officials do not care what they think suggests that Alabamians do not believe state government is responsive to their concerns. 86% support expanded rehabilitation and re-entry programs for people in prison. 83% support moving people with nonviolent convictions back to the community. 58% oppose building new prisons to address overcrowding. 54% believe only violent offenders should go to prison. 69% support increasing taxes to support education, but no single option garners majority support. 45% say they pay the right amount of taxes. 45% say lower-income earners pay too much. 52% say upper-income earners pay too little. 82% support keeping the General Fund and Education Trust Fund separate. 69% believe state government officials do not care about their opinions. 57% believe they have no say in state government. The survey of 410 randomly selected Alabamians was conducted between January 28 and March 3, 2019 and yields a margin of error of +/-4.8 percent. Jefferson County mayors and county commissioners announce a cooperative economic development pact Wednesday at the Jefferson County Courthouse. Mayors from 22 cities in Jefferson County signed a “Good Neighbor Pledge” Wednesday, committing their cities to a set of economic development ground rules designed to prevent incentive bidding wars and counterproductive poaching between the patchwork of municipalities that comprise the county. With the Good Neighbor Pledge, the mayors hope to end divisive competition and encourage cooperation in recruiting new business from outside the region. Recruiting businesses from one Jefferson County city to another with incentives costs both cities and results in no net gain for the region. The Pledge is an outgrowth of the Community Foundation of Greater Birmingham’s efforts to encourage regional cooperation and job growth in Jefferson County, an effort that began by commissioning PARCA to research and report on models of cooperation from across the country. The resulting report, Together We Can, provided information that the Jefferson County Mayors Association built upon to craft the Pledge. The 22 cities represent over 75 percent of the county’s population, including the City of Birmingham, Bessemer, Hoover, Mountain Brook, Vestavia Hills, Homewood, Trussville, Argo, Brighton, Center Point, Clay, Fairfield, Graysville, Lipscomb, Midfield, Mulga, Pleasant Grove, Sylvan Springs, Tarrant, Trafford, Trussville, Vestavia Hills, Warrior, and West Jefferson. 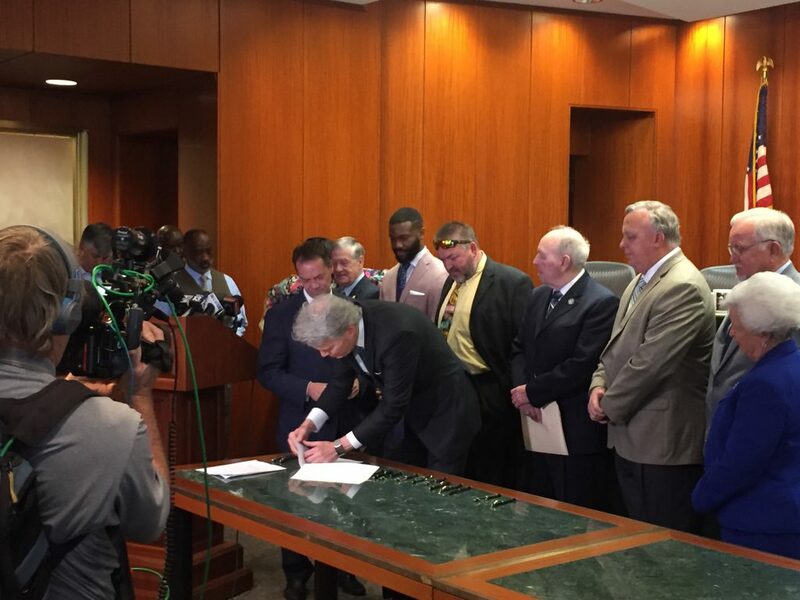 The signing of the pledge took place in the Jefferson County Commission chambers and featured Birmingham Mayor Randall Woodfin, Jefferson County Commissioner Steve Ammons, and Jefferson County Mayors Association president, Center Point Mayor Tom Henderson. They were joined by other commissioners and mayors from cities big and small. The agreement grew out of conversations within the Jefferson County Mayors Association, which were facilitated by the Community Foundation. Of the various cooperative approaches described in Together We Can, the mayors found Denver’s model for encouraging cooperation as the most promising and achievable first step. In Metro Denver’s effort to unite its sprawling and fragmented region around a unified approach to economic development, one of its first steps was creating a Code of Ethics that spelled out what is acceptable and what isn’t when cities are working to recruit businesses. Denver’s agreement aimed to stop cities from fighting over local business relocation and focus instead on a collective approach to attracting new business from outside the region. In addition to the Code of Ethics, Denver developed a Metro Mayors Caucus, an issue-oriented regular meeting of area mayors which facilitates communication and cooperation among the region’s cities. Both ideas helped launch the effort that bore fruit Wednesday. The conversations at the Jefferson County Mayors Association spawned a committee chaired by Mountain Brook Mayor Stewart Welch, which examined Denver’s Code and gathered other examples from across the country including local government agreements in place in Milwaukee, San Diego, Dayton and Cuyahoga County, Ohio; and the Fort Wayne region of Northwest Indiana. The committee then drafted a version for Jefferson County. Mountain Brook Mayor Stewart Welch prepares to sign the Good Neighbor Pledge. The Pledge is not a legal document but an agreed upon set of principles and protocols. It establishes an Advisory Consulting Committee to serve as a forum for interpreting the pledge in real-world situations and resolving disputes that might arise. The mayors pledged not to initiate contact with a business located in another Jefferson County city with the intention of enticing that business to relocate. And if a business is seeking to move from one Jefferson County municipality to another, the mayors pledged not to offer financial incentives to encourage the move. On the other hand, the Pledge encourages mutual aid in efforts to recruit businesses that are new to Jefferson County. The Pledge does not apply if a local business is expanding and establishing new operations that will not result in job loss in the original municipality. Along with the Pledge itself, more comments from the various mayors are available in the news release distributed Wednesday.